And when I say “finally” and it implies that I’ve been searching for a while, it’s a true statement. I finally found erasable colored pencils for my planner. I know that you can now get super cute “cancelled” stickers, and even some sarcastic “nope” stickers to cover up things that didn’t happen in your planner – and I like those, I do – but in my life, things change like crazy and I’m constantly needing to “pencil” something tentative in. Pencils just aren’t cute in a highly decorated planner. But neither is crossing out things that should have happened but didn’t, or filling up more boxes than you care to admit with those clever “cancelled” stickers. I’ve been on the hunt for erasable colored pencils for planner use for about 3 weeks now, having tried several I’m content (happy, really) with the latest ones to cross my desk. 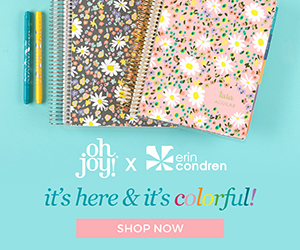 There are 8 colors (7 usable) for planners – the yellow is dark enough to read but who wants to hold their planner up to the light to figure out where they are supposed to be next? They are bold enough on paper to be seen and they work well with planner stickers (I worried that when I wrote on a sticker blank they wouldn’t work. Glad to see my worries were unfounded). Erasable – have you tried to erase a regular colored pencil? Some will but most won’t. Some of the colors do erase more fully than others – the picture shows just a couple of passes with an eraser and you can see that the purple and red could use another pass – but (and I know I’m preaching here) that certainly beats scribbling out things or sticking cancelled stickers everywhere. So far this is the only place I’ve been able to find them but they are certainly worth grabbing. Do you own these or another erasable writing product for your planner? I’d love to hear about them in the comments below. Oh – and pin this for your friends! I never thought about erasable pencils, but I LOVE my frixion pens! They write smooth and dark, but erase oh-so well!!! Have you tried the Pilot FriXion pens, if so how does it hold up to this? Was the ink wetter, duration in which it dried (so it won’t smudge when I close the planner after writing or write something next to it accidentally swiping it), and how was the erasability. If you have any insight, I would appreciate it! Hey Natalie! I recently wrote a post about FriXion pens here I really do love them – they don’t stay wet for too long, they don’t write thick and goopey and for the most part, they dont show through to the other side of the page. I don’t find them to be readily available in my local stores so I grabbed mine offline. I bought a bunch of colors but in the end, I only use the black one.